It is crucial to craft a time-table or schedule in a very strategic manner for oneself. Doing so will help the aspirant to follow a specific plan during the exam day and discipline oneself accordingly especially now when there isn't much time left for the exam. It does not matter what time of the day/night one decides to revise for the exam, they must bear in mind that it is not worth spending time studying too much for long hours, especially over weak area in this last moment. If they do so, they won’t be able to complete their revision in the given time period because of fatigue. A break now and then will do them a lot of good. The important thing to remember is that one should be mentally fresh and ready to absorb at that point of time. Remember, quality is always better than quantity. Still, 6 hours per day is necessary in these remaining days to achieve a 95 plus percentile (700+ composite score). The candidate should read newspapers and magazines, watch English language news channels to avoid monotony and thus, also prepare for general awareness section. One of the most important factors to consider while preparing for MAT February 2019 is maintaining a good balance between accuracy and speed. The time given for completing the exam is limited (only 150 minutes for 200 questions) and hence answering the questions accurately keeping in mind the time consideration is the key. 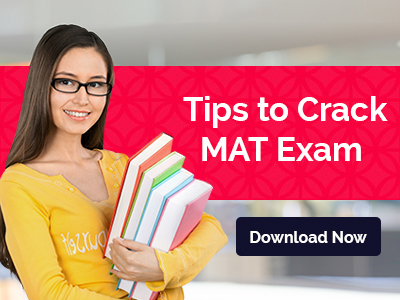 Towards the last days of the test, developing a proper test taking strategy is an approach that a MAT February 2019 aspirant has to develop in order to ensure that he/she is able to leverage the strengths while attempting the tests. Any strategy that one intends to follow should revolve around the time saving measures to answer the maximum number of questions in the allotted time. We, at MBA Rendezvous wish you all the success in the upcoming MAT Exam.